Here’s what I’ve been working on over the last couple of weeks. That’s it. Go home. All in a good day’s work. I’m here to show you a more proactive way to promote your digital content. You put in a lot of work to create killer content. You should put in just as much time to promote it. This is where outreach comes in. Experts use this tactic all the time. Brian Dean (CEO of Backlinko) writes personal 1 on 1 emails to 100 people before he publishes each post. In their content marketing handbook, the awesome folks at Priceonomics recommend you email at least 50 people after every post that you create. Alex Turnbull from Groove got 1,000 subscribers under 24 hours with this technique. It just works. This is the most crucial part of an outreach strategy. In this stage, we are going to create an excel spreadsheet of the people we will reach out to. The list should include each contact’s first name, last name, email address, Twitter url, Facebook url, and LinkedIn url (if we can find that info). There are a few different types of people you should reach out to. Who is the most likely person to share your content? If you answered someone who shared similar pieces of content, then you are absolutely correct! My good buddy Giuseppe Frustaci recently mentioned the Skyscraper Technique at breakfast. In the Skyscraper Technique, you find a post that many people have shared. Then, you go and create an even better post on that same subject. After that, you find the people who shared that original post, and you ask them to share your post. In essence, it’s the fast follower strategy. Step 1 is to find posts that are similar to yours. Google the title you were considering for your post. Some posts that are similar should pop up. Write down the names and URLs of a few of these posts. If nothing relevant came up in the first search, then search the subject you are writing about (instead of the full title), and write down a few URLs and titles. If you don’t have any budget, you can do a search on Twitter for the links you wrote down. Make a list of all the users who shared these links. Pay particular attention to the top tweets tab. This is a built in filter to find tweets that Twitter would consider higher value than the “latest” tab. Use tools to find sites that linked to these posts. Here are a few free tools to help you do this: Free BackLink Checker from MonitorBacklinks.com, Open Site Explorer from Moz, and Majestic. If you’re getting serious about this, you might want to check out ahrefs. Industry leaders like Brian Dean and Neil Patel use ahrefs and pricing starts at $99 per month. Did you link to another blog in your post? Did you mention an influencer or a friend in that post? If so, you should put these folks on your list and reach out to them to let them know. People love reading things when they are mentioned or when someone links to them. These are great targets for your campaign. They have an incentive to share your post and there’s a good chance they also have an engaged audience. Extra note: Make sure you link the names of people and websites you mention in your post so it is easier for your visitors to find them. It also helps the people you mention by giving them backlinks – which is a nice gesture. Your blog probably has existing fans. These can be random people on the internet, your mom, or friends who support your work. They probably popped in your head as you read that last sentence. It’s okay if you don’t, but there should be a few friendly people who will be willing to share your link just because they like you. If you know a few people who fit this description, shoot them a message and ask them to share another one of your posts. If you are creating content for a company, you probably already know your company’s Ideal Customer Profile (ICP) (side note: That link goes to Lincoln Murphy‘s blog. He’s really smart and you should subscribe to his newsletter if you want to learn about marketing and growth hacking). If you don’t know who your ideal customer is, I highly recommend reading Find Your Ideal Customer Profile by Aswin Natarajan. In that post, Aswin goes through 8 questions you should ask yourself that will help determine who your ideal customer is. Knowing your ideal customer opens up a world of possibilities with email outreach. If you know the exact profile of the type of person you created content for, you have the ability to find and reach out to them directly on LinkedIn. I suggest LinkedIn here because it easily allows you to find people by industry, job title, role, and location. Later in this post, I mention tools to help you find email addresses from LinkedIn. The odds of getting shares or backlinks from this audience are much lower than the methods mentioned previously. Also, keep in mind that when you are sharing content directly with people you don’t mention in the post or that didn’t share similar content, you’re starting to move into gray hat territory. I would only go this route if you have a very specific idea customer and if you truly think this post will add value to their lives. 2. Research the users you think will share your content. Based on the data you’ve found, you should now have a decent sized list of people you want to contact. The actual size of the list is not important. What is important is that you have people on a list, you plan on emailing about your content. The next step is researching the people on this list. You want to get a general idea of who they are and what you should say to them. You should start with their social media profiles. If you plan on using Gmail to send each emails, here’s a great post from Srikanth AN on Beebom that mentions chrome extensions to help you find social media accounts for each user without leaving Gmail. If you’re a developer, I suggest looking into Clearbit and FullContact. Both of these companies provide APIs to quickly find information and social media profile information for the people on your list. I like to mention when I went to the same school as someone. Do you have similar friends in common? Always nice to show how small of a world it really is. Did their company recently raise a fundraising round? Say Congrats! Was this person or their company mentioned in the press recently? Say Congrats! Do you both love tacos? Love the fall in the Northeast? Hate romantic comedies? At this point, you probably understand what we’re trying to do here. We’re looking for something to break the ice. Show each person you did your research on them and that you have something in common. If you are like me, then you can spot the difference between an email template and a highly personalized email. So when you are reaching out to someone, you should do your research on this person and make sure they know it’s not a template. 3. Find contact information for them. You may have email addresses for a few of the people on your list, but I’m guessing there are some you don’t have email addresses for. Maybe you’re limited to their Twitter or LinkedIn profile. How are you going to get in touch with them? Have no fear — there’s an app for that! There are some great posts on finding email addresses. If you want to read more on the subject you can read this by Scott Britton or this by Bernie Reeder of Yesware. If you’re like me and you want to be able to do this quickly, you should be aware there are tools that make it really easy to find emails from social media profiles. Below is a list of great tools to find email addresses. Some offer chrome extensions so you can easily grab emails from sites like LinkedIn. Others have a web interface where you type in an first name, a last name, and a domain name, and they find the most likely email address. Give each of them a try and find the one that works best for you. 4. Write a highly personalized email. Here is where you use your research in order to create a highly personalized email. Highly personalized emails get response rates 350% higher than non-personalized emails. It’s worth the time to personalize each email. I have a list of more in depth resources below to help you personalize emails if you have more questions, but here are two quick things I want to touch on. Look for things you have similar with each person (from the research you did earlier) that might be uncommon. Maybe you worked at the same startup previously. Maybe you both hate brown rice. Maybe you don’t have an uncommon commonality, but look for any commonality you can mention in a subtle way. A common technique I like to use is to find an article someone wrote that I really enjoyed or highly agree with. Take a minute to try to find a few articles each user may have written. Showing someone that you read something they wrote and really appreciate it can go along way. If you’re going to go this route, make sure you have something thoughtful to say about the article you are referencing. If you just say that that you loved the article or it was really insightful, you could just as well be a robot. Don’t forget, the main task is to show these people that you are not mass emailing them, but you are putting a lot of thought into each message you send. Here’s a Guide to Cold Emailing from Harvard Business Review written by the infamous Tucker Max (if you don’t know who Tucker Max is, go Buy I Hope They Serve Beer In Hell, and then thank me later for the hilarious book recommendation). This step might make you nervous. You are exposing yourself to criticism. This is natural. Everyone feels this way before hitting send on these emails. Believe it or not, it is a good thing you feel nervous about hitting send. This shows that you care. This means you want to only email someone if you think the piece of content you wrote for them is amazing. This is what you should strive for in all of your content. If you are using Gmail to send these emails, I suggest downloading the Hubspot for Sales chrome extension. This allows you to track every email and see who opened it, which will become very useful for our final step. Send the email. You’ve come this far! This is a lesson I’ve learned from cold sales emails. When sending a cold sales email, the typical person will not respond to the first email you send, so you should send followup emails. There is some debate on the amount of follow ups you should send. In fact, the people at Woodpecker wrote an entire article on cold email followup. Some people say you should only send two emails, while other people think you should followup seven times. The key idea is that you should send more than 1 email. If you want me to make this super simple for you – follow up twice. Follow up once two days after the original email if you don’t hear anything. Follow up again 4 days after the first followup (6 days after the original email). Also – before following up, double check they didn’t share your post on Twitter. It’s possible they shared the post without replying to your email. Email outreach is important for new blogs and existing blogs. It’s the best way to find new readers. Remember that when creating any content, your main focus should be on creating value. When you write a post that creates a lot of value, you’re doing everyone a favor by sharing that value with everyone who would benefit from reading it. Thanks for reading and good luck with your campaign! This is the second post in our “How They Sell” series. In this series, we take a deep look at how different B2B companies perform outbound sales. Audience Ops is a done-for-you content marketing service. It offers packages that plan, write, and send content marketing for your business. Packages include audience research, content calendars, email marketing automation, blog articles, and more. Audience Ops is run by Brian Casel, who also cohosts the Bootstrapped Web Podcast. When Brian started experimenting with outbound sales, he started where most people start— his personal Gmail account. Brian’s first outbound experiment consisted of manually sending 20 canned emails to people he thought would be interested in Audience Ops. In that early experiment, Brian got a good response from one person. That person turned into a very good lead. Over time, Brian learned and tweaked their sales process to become better and more efficient. According to Brian, “Audience Ops works best with B2B online software businesses”. The problem Audience Ops wants to solve is helping businesses publish more content on their blog. Comments on The Ideal Customer Profile: This is a great customer profile. This narrows the ideal customer into a very specific industry and then gives two characteristics of the companies targeted in that industry – having a blog and being B2B. Whether a company sells online software can be hard to determine automatically, but if you are able to put a system in place that identifies SaaS companies, you will have a highly targeted list of prospects. Now that we have a firm grasp on what Audience Ops looks for in a prospect, let’s take a look at how they find these people. Brian uses a combination of Wikipedia and Capterra to find prospects. I think finding leads from Capterra can provide a lot more value than Wikipedia, so I’m going to focus on leads from Capterra in the rest of this section. Capterra is a tool built for businesses to help find the software that will solve specific business problems. 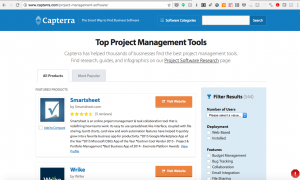 For example, if you are looking to solve a project management problem at work, you would search for “Project Management Tools” on Capterra, and it would provide you a list of project management tools. Before I continue, I want to acknowledge that Brian uses a virtual assistant to perform this manual section of his work. I’ll discuss various uses for virtual assistants in a future post, but I wanted to make sure you realize Brian isn’t actually doing this research himself, although he probably did when he first started. On Capterra, there are several categories that contain companies that fit Brian’s Ideal Customer Profile. For example, if he searches “Project Management Tools” or “Customer Relationship Management”, the companies that appear would consistently be ideal targets. Brian gives his virtual assistant of list of these categories to search for on Capterra. His virtual assistant uses these search terms to create a spreadsheet of companies that he should find leads for. The second part of the research involves finding the right contacts at these companies. To find this data, Brian’s VA will look for the name of the CEO or founder on the company’s about page, on Crunchbase, or on LinkedIn. At this point, the spreadsheet will contain four columns—company name, company domain name, first name of contact, and last name of contact. They are almost ready to contact the prospects at this point, but there’s only one problem—there’s no contact information! To solve this problem, Brian has his virtual assistant load the spreadsheet into LeadFuze. Leadfuze allows you to upload CSV files into their system, and will attempt to find the email addresses for the contacts in the spreadsheet. It usually finds about 30% of contact emails. This is an ongoing process – not a one time researching activity. The ongoing process involves finding a couple hundred working contact email addresses every week or two so there is a continuous funnel of new prospects to reach out to. Now that we have a list of prospects and email addresses, it’s time to reach out. Brian uses QuickMail to send the emails. Quickmail offers the ability to create email sequences to send to prospects. He sends three emails total, with a period of three days in between each email that is sent. QuickMail ensures that, if a prospect replies to Brian’s email, the sequence won’t send any additional emails to that person. The reply email goes directly to Brian’s inbox, where he has the ability to continue the conversation is a more intimate, one on one way in order to close the sale. QuickMail also has a feature (also used by Audience Ops) that syncs up with Google Sheets. Audience Ops has a system in place where, every day, QuickMail will grab the top ten emails from that spreadsheet, and will start the sequence. As long as this automation is on, the virtual assistant can continue filling up the spreadsheet, and QuickMail will send out ten emails every morning (this will go on indefinitely). Brian set up a separate domain to send emails from QuickMail—this stops his actual domain as getting dinged as spam. Brian’s emails typically also say something like, “I’d love to share a few ideas for what you can do at your company that works with our clients.” The idea here is that he’s offering valuable information to prospects if they follow up with him—giving them one additional incentive to reply. Audience Ops is not cheap. the plans start at $950. There is also no ability to checkout on the website. This makes me think there is a fairly high need to convert traffic and they may or may not take credit cards. If you compare this post to the previous post about Boston Startups Guide, you can see this method is a little more sophisticated. There are more formal processes – they use email sequences, and they even outsource some of the more manual tasks in the sales process. Send me an email (bob@curtact.com) if you want your sales process featured on the blog. This is the first post in our series of how companies sell. In this series, we will take a deep look at the tactics, tools, and techniques companies use in their sales process. In this first post, we will take a look at a sales process at the simple end of the spectrum. Jay Neely is a good friend of mine and runs Boston Startups Guide — a site for the local tech community offering resources like a directory of startups in Boston, categorized by industry, business model, and if they’re hiring. The main revenue source for Jay’s website is the job board for Boston startups. Jay’s website gets a ton of traffic from people interested in Boston startups. Many of those people are looking at startups in the area because they are job hunting – it only made sense that Jay would attempt to monetize this website by creating a job board. For a job board to work, you need two things: 1.) people looking for jobs and 2.) companies who pay you for job listings. And that’s where the sales process starts. Jay needs to find startups in Boston who will pay for their openings listed on his job board. Here is how Jay sells today. Finding your ideal customer is the first part of any sales process. Part of the equation for Jay was simple – he was looking for a certain size company (“a startup”) in a certain region (“Boston”). Although this made it easy for Jay, there was still work to be done. Jay needed to answer a few more questions in order to find his ideal customer profile. He needed to find out which startups were likely to pay to post jobs on job boards and he needed to know which people to contact at those companies. Jay performed competitive analysis of which startups post job openings on LinkedIn. One thing he quickly noticed is that a company with many open positions is much more likely to pay LinkedIn to use their job boards. Jay used this insight to target companies with at least 5 currently open positions. Through trial and error, Jay also found which people at a company he should contact. Jay sent emails to the people he thought he should send emails to. After sending numerous emails, Jay determined which people he should reach out to based on the replies that led to the most sales. Jay eventually decided on a “tiered” approach. Jay has three job titles that he looks for in companies. First, he first looks for the director of recruiting. If he can’t find a director of recruiting, he looks for a head of HR. And if he couldn’t find the head of HR, he looks for the CEO. Now that Jay knows exactly who he is looking for, it should be fairly easy for him to find companies that fit the profile. Since Jay is on a tight budget with this project, he is not able to pay for contact lists, so he needs to find this data on his own. The great part is that Jay’s website, BostonStartupsGuide.com already contains most of the startups in Boston. The challenge for Jay is to now find which companies are hiring at least 5 people, if they use similar job boards, and who to contact at these companies. The resources that Jay used to find this data was LinkedIn and the company’s website (careers page specifically). Jay manually put in the work to research how many open jobs the company currently has (from their website), if they pay for the LinkedIn job board, and who the correct person to contact is (from LinkedIn). He compiled this data in a Google Doc. Jay also needed to find contact information for those leads. I believe he used Rapportive to reverse engineer email addresses. This is where Jay struggled. Jay is not a salesman. If I were to categorize Jay, I would think of him as a social media consultant, an intellectual deep thinker, or a techie, but salesman is not a term I would use to describe Jay. Jay was originally put off by sending cold emails because he didn’t want to “spam anybody”. At first, Jay was sending as little as 2 emails a week – and they were only to people who he knew. Jay got a quick win and found two customers for his job board in the first few weeks – it was awesome! It took a few conversations with Jay to get him to start sending more emails. I told Jay that if he genuinely thought he had a useful search that could help people, he was doing a service to the world by telling these companies about it. In terms of email tracking, keeps it simple and sends emails directly from his Gmail account. 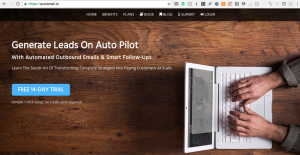 He does use “Hubspot Sales Free” Chrome Extension to track email opens and clicks. Jay uses a very personalized touch when sending email. He takes a large amount of time and care to research and craft a very personalized email each time to emails a prospect. The close isn’t particularly hard for Jay. His job board is a relatively low price point ($59, $99, $199 – not thousands or millions of dollars) and he usually gets a quick yes or no after a short email exchange. Jay accepts payment on his website through Paypal. Usually, no additional person from the company is needed for purchase approval during this sales process. As you can see, this is not the most complex sales process. Jay doesn’t use many third party tools except for Google Docs. However, his sales process is well thought out and he does a great job targeting prospects and taking the time to craft highly personalized emails. -Do They already pay for job boards? This is great! Jay knows exactly who is Ideal Customer Profile is and having a narrowly defined list of what to look for should really help Jay find the prospects he needs to get in touch with. This was a tedious task for Jay, but he needs to do the leg work here up front. He needs to understand the nuances of what to look for. Over time, he may consider using a virtual assistant for this task. I love that Jay uses his own website data. This gives him a unique competitive advantage when contacting startups. He takes time to compile his data and has data about many of these companies that other sales organizations wish they had. I think the personal touch Jay uses to contact leads is great. Its a great quality because it forces Jay to do a lot of research for every email he sends and it allows him to spend time crafting a few quality emails at a time. I think Jay needs to improve the quantity of emails he sends. He can still do this with the amount of time he puts into prospect research. He needs to make sending cold emails more of a priority each day. Jay is at the very early stages of his sales journey. The tools that he uses will evolve. The amount of emails he sends will evolve. The phrases he uses in his emails will evolve. He’s still at a very manual stage.